I’ve changed the drawing of Jess and Frankie submitted in a previous post. I’ve brought up the contrasts, color and value, allowing the dog to project forward, I chose to take the liberty of pulling the blanket up and over the subjects. This device provides continuity as it moves throughout the composition. 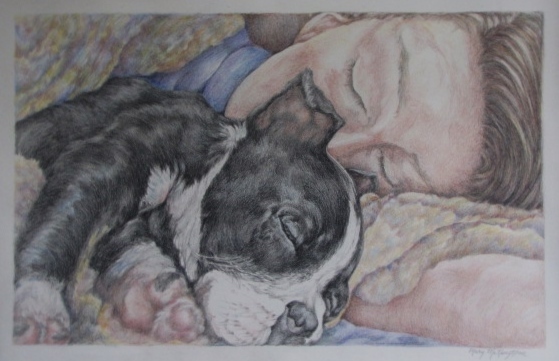 The blanket also helps to tell the story of a young woman and her dog nestling into its warmth and softness. Still not sure if I’m done. Any comments and advice are welcome!! You are currently reading Reworking Jess and Frankie at Dr. Mary McNaughton and Drawing.